When Matt Herrick was 17, his father was arrested for robbery--a bank heist gone wrong. Herrick joined the Army and was sent off to Afghanistan--a trip that would change his life. Now Matt Herrick is faced with a choice: Can he let his dad and Donne save his mother, while letting the heist go off without a hitch? Or can Matt Herrick save his mother, and stop the the heist before everyone ends up in prison--or worse--dead? 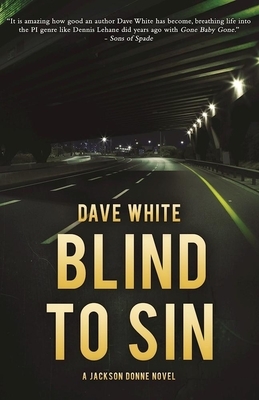 Dave White is the Derringer Award-winning author of six novels: When One Man Dies, The Evil That Men Do, Not Even Past, An Empty Hell and Blind to Sin in his Jackson Donne series, and the acclaimed thriller Witness to Death. His short story "Closure," won the Derringer Award for Best Short Mystery Story. Publishers Weekly gave the first two novels in his Jackson Donne series starred reviews, calling When One Man Dies an "engrossing, evocative debut novel" and writing that The Evil That Men Do "fulfills the promise of his debut." He received praise from crime fiction luminaries such as bestselling, Edgar Award-winning Laura Lippman and the legendary James Crumley. His standalone thriller, Witness to Death, was an ebook bestseller upon release and named one of the Best Books of the Year by the Milwaukee Journal-Sentinel. He lives in Nutley, NJ. Follow him at @dave_white. He lives in Nutley, NJ.